While we hope you’ll find it easy to use, we’ve compiled a list of some frequently asked questions. What is educational about this product? It uses the most effective methods of accent reduction through see-through 3D animations. These easy to use, comprehensive lessons include; retraining your articulation muscles, interactive jaw exercises and face diagrams to instruct proper tongue placement. What accent does the application use? 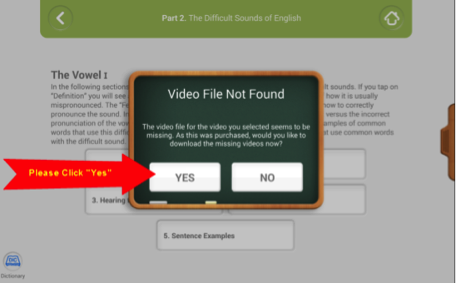 The application features the voice of a woman with an American accent, but has the ability to record and save your own voice. Does PEP support other languages? No, as of now PEP is only available in English. In the future there will be more languages available. How good does my English have to be to use this? You must at least have an intermediate level of English to use this app. You must contact the app store to receive a refund for PEP. The videos I purchased are missing. How do I restore them? 1. After you make your purchase and click on the unlock button, you will see this window pop up on your device (This is normal!!). It means you should download all content from our server. We recommend connecting to Wi-Fi before downloading. Click ‘Yes’ to download the 530 video files. 2. When you click the button, you will see window below. Most people experience problems here. Please be patient as it will take some time (especially if you purchased the full version) to download all files (1GB). 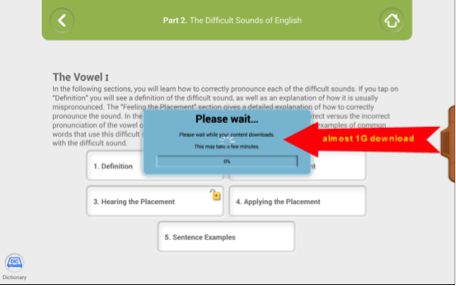 Even though it may seem like a slow process, please be patient as our server is located in U.S.A.
What makes this app different from other English pronunciation apps? Unlike other accent reduction/English pronunciation products that rely on solely mimicking of audio sounds, PEP focuses visually, audibly, and narratively on the physical ability to speak English. PEP video clips feature 3D animations of see-through faces so you can see the jaw, teeth, lip, and tongue placement while learning English pronunciation. Also included is an audio and video recording feature for you to focus on your own voice and face. Yes, it is free to download & comes with some free videos. If interested you can choose to purchase each part individually or purchase the full version all at once. The prices are displayed below. Some questions just can't be cleared up on the forum or in FAQ items etc. If you could not find a satisfying answer in any of the information resources, please contact our PEP support team. 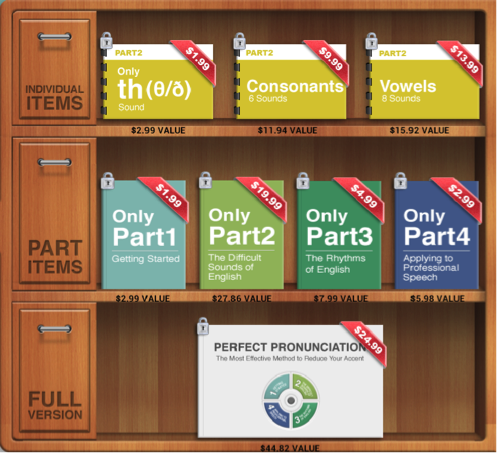 Perfect English Pronunciation™ is a registered trademark of Victoria Productions Inc.